Custom events and buttons can be used to pass call information from Go Integrator Client to other software using command line parameters under conditions specified by you. When you set up your custom event parameters in Go Integrator Client, what you are effectively doing is using your chosen app's normal syntax except you substitute real call information with the name of the call information as in the example below. You can find the call information names and descriptions in the "Passable Call Information" section below. 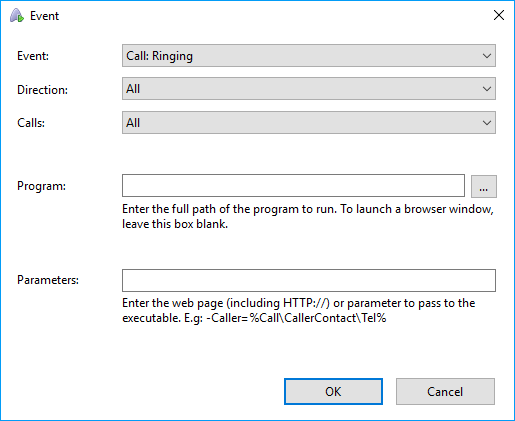 Then, when Go Integrator Client runs your custom event, it inserts the current call information into the parameters where you have specified. Please note that command line instructions and parameters are usually entered manually using the "Run" window but you won't be doing that. Once your custom event has been set up, Go Integrator Client takes care of everything. We will get to setting up your own custom event shortly. Also note that the structure of a command line instruction (also called "the syntax") can vary a lot from app-to-app. For example, some apps' parameters start with a hyphen character (-) like "-Phone" but other apps use a forward slash (/) instead like "/Phone" etc. Whatever syntax your app uses, the principle is generally the same. Remember, the call information name must always be enclosed in '%' signs to properly identify it, otherwise the information will not be passed correctly. When Go Integrator Client runs your custom event, it inserts the call information into the parameter in place of the call info name e.g. if the other person's phone number is "6329603210", telephone = %Call\Contact\Tel% becomes telephone = 6329603210. The program that gets triggered – This could be a CRM app or any other software. Please note that the passing of information between Go Integrator Client and your chosen app will only work if the app is capable of receiving command line parameters. The information that will be passed – There are several different pieces of information that can be passed from Go Integrator Client. These are listed in the "Passable Call Information" section along with further guidance on their use. This info can be passed to the triggered software along with any other parameters that are supported. Right-click the Go Integrator Client tray icon in the system tray menu and then left-click the "Configuration" option from the menu that pops up. 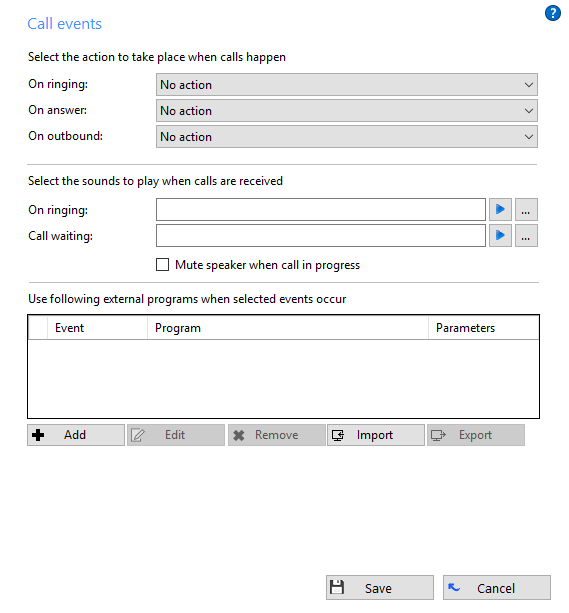 In the "Events" area, click the "Call Events" button to display the "Call Events" settings screen.